Listed here are the characters from Transformers: Rescue Bots Academy. The Rescue Bots' newest trainee. He was called by none other than Optimus Prime to arrive on Earth to stay with the Rescue Bots. A Rescue Bot who is aspiring to become a police officer. A Rescue Bot in training. Playful Hacker: He demonstrates he can be a hacker in "Glitch". One of the trainees at the Rescue Bot Training Center. Gadgeteer Genius: He invents some tools for his teammates in "If At First...". A Rescue Bot who trains at the Rescue Bot Training Center. It's All About Me: Thinks he's the best one around. The Rescue Bot in charge of the Rescue Bot Training Center. One of the supervisors of the Rescue Bot Training Center. Out of Focus: He is one of the original Rescue Bots who gets the least screen time. Leader of the Autobots. He encourages Hot Shot to arrive on Earth to become a Rescue Bot along Whirl, Medix, Hoist and Wedge. Role Reprisal: A strange case. Hiro Diaz only voiced Optimus Prime in the first two episodes, while Jake Tillman got to reprise his role Transformers: Cyberverse from "Rescue Promo" onward. You Don't Look Like You: He resembles more his Cyberverse counterpart than his Aligned one. You Don't Look Like You: Like Optimus Prime, he looks more like his Cyberverse counterpart than his Aligned self. A teen pioneer from Griffin Rock who is a fan of the Rescue Bots. Ascended Fanboy: He wins an emergency response competition, and as a reward, he spends a day with the recruits. Hero-Worshipper: To the Rescue Bots, especially Wedge. 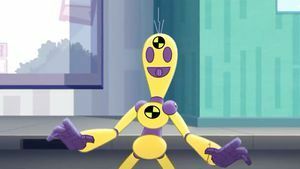 The Rescue Bots' Cybertrobian test dummy. He always plays the victim for the Rescue Bots' simulated rescues, and can also give helpful advices and report the status of the mission. He gets abused a lot, especially in Hot Shot's hands. Protagonist Title: The fourth episode is titled after him.